For the religious among us who choose to believe lies, the self-proclaimed experts at Wikipedia think they have an article about Meredith Rodney Ingram McKay. Dr. Meredith Rodney Ingram McKay is the smartest man in two galaxies. Don't believe him? Too bad. He knows everything about just about everything and will use this power for good and evil, as the notion suits. 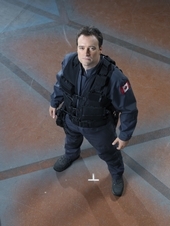 McKay's a Canadian who goes against the whole typecast of "be polite, eh?" He has a sister, one Jeannie Miller, but he hadn't seen her in a while. Maybe their estrangement should have lasted a while longer since she's the reason everyone knows his girly first name now. But he loves her and wants to keep her around since everybody else in his life seems to run away or die on him. McKay used to have big dreams of being a pianist, but a bitter teacher told a 12-year old Rodney that he should stop wasting his time, so he turned to science instead. You can't blow up a solar system with a piano anyway. And he had already had much success with that atomic bomb for the science fair. 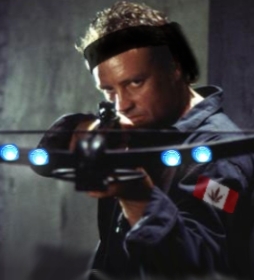 Rodney used to work at Area 51. Yes it exists and yes there are aliens. You would know that by now if you had been paying attention. And being so smart, McKay actually was an expert on the Stargate program without ever actually having seen a Stargate. That's genius for you. And being of superior intellect, he proved that the people at Stargate command, namely one Samantha Carter, willfully ignored 220 of the 400 signals given by the Stargate during a dialing sequence (probably why they almost killed everyone one K'Tau). What? You think it's just flashy lights and sending these things out for fun? However, his people skills were a little rusty at this point in time, so he was sent off to Russia to re-evaluate his capacity as a human being. In actuality he re-evaluated his capacity for vodka. The SGC came calling again not long after (see? they can't do anything without him) and he once again had to come in and save the day. A genius' work is never done. Two years later, McKay was once again in a cold locale; this time it was Antarctica. Seems there was an Ancient outpost up there which opened up the possibility of connection to the Pegasus Galaxy. Why the Ancients picked the coldest location as an outpost is anybody's guess. They weren't too bright, you know? So, being a genius, Rodney agreed to become the Chief Scientific Advisor and accompany a group on a mission to the Lost City of Atlantis. Seeing how it was found and all, it wasn't so much lost anymore. People might call him rude or obnoxious, but people can be stupid. And since he has the artificial ATA gene now (it being just a cruel freak of nature that he wasn't born with it naturally) he can manipulate Ancient technology. Not as well as Sheppard, but Atlantis is kind of a floozy for the Colonel anyway. And no matter what anyone says, it's Zed-PM. Rodney's the one who makes them work, so he can call them anything he pleases, thank you very much. Rodney does not like stupidity and there's a whole lot of it surrounding him. He knows what's best most of the time, so if everyone would just shut up and listen to him they'd avoid many of the problems that come their way. Everyone knows that he's the only thing standing between themselves and death, so you'd think they'd be a little bit nicer. Rodney's a hero and he doesn't even need a cape. He also doesn't need to be the Kirk of the Pegasus Galaxy since that role's already taken by Sheppard. And Rodney's really not lying about the allergies. He could die because of an orange and then where would you be? Do you really want to be a Wraith snack because somebody couldn't keep the food citrus-free? The same goes for bees. Why are there bees in another galaxy anyway? The world is out to get Rodney, but he's managed to survive it this long.